At 1.00pm I received a call from Sky asking me if I wanted to have my HD box earlier than Monday, I pointed out that I had expected to have it today so my answer to her question was in the affirmative. She said to give her 10 or 15 minutes and she’d ring me back. One hour and 45 minutes later I was still waiting and wondering what was going on and had yet another visit been cancelled without telling me. I returned her call but the number she called from is not available to mere customers so I rang the main number and having gone through the number of options yet again I got an advisor, that’s fourth I’ve spoken to today. I had to explain the whole sorry mess again and he said “I see your installation was cancelled. Why was that?” Poor bloke, it’s lucky I’m totally exhausted by the situation or he’d have got both barrels. He didn’t know who had rung but confirmed that the installation was still booked for Monday morning. At least this bloke admitted that all their apologies for my inconvenience were meaningless and he put in a request for a credit of £40 credit to be applied to my account. On Tuesday my Sky+ box went wrong so I rang and booked a service call for Thursday afternoon. After a conversation with J it seemed more economical to adjust my package and upgrade to an HD box. I rang back and they cancelled the service call, arranged the adjusted package and the installation of an HD box for this afternoon. I was a happy bunny ‘cos I’d have it for the weekend and be able to record the final of the US Open (always a night game and I can’t stay awake that late). This morning I received a letter from Sky saying “Welcome back” and my account was £51 outstanding “please ring ….to arrange payment”. Very confused I rang Sky only to be told that I should ignore the letter but that the installation visit had been cancelled. 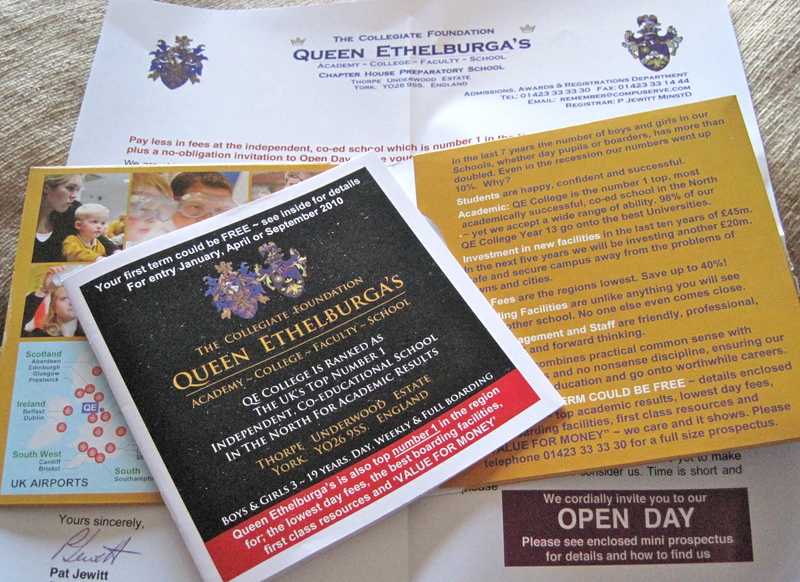 I assured them that I had not cancelled but they couldn’t tell me why the visit had been cancelled or by whom! I was tranferred to three different advisors and eventually I demanded to speak to a manager but despite being on the phone for almost an hour (a good proportion of which was me being put on hold) all I achieved was them repeating empty apologies that the visit had been cancelled but no explanation. Not only that they could not re-instate the visit and could only book a new call for Monday morning. I’ve been a customer of Sky for many years but this doesn’t seem to matter to them. Oh yes, they will reimburse me for the days I haven’t had the Sky+ service but it seems to me that, as my son says, as long as they can screw you for as much money as possible, customer service comes a very poor second. Another point is that had I not received the weird letter from Sky I would have been sitting here all afternoon waiting for them to arrive. A letter to the CEO, Jeremy Darroch, is on it’s way but I won’t hold my breath!!!! Today I visited a chiropractor for the first time. When I lived in Nottinghamshire any issues I’ve had with my back and neck were sorted by a visit to a friend who is an orthopaedic physician, now I have no access to him unless I make an 180 mile round trip. My problem started last Monday, when after enjoying my post-gym cup of coffee I found I couldn’t stand up without severe pain in my lower back. I wasn’t aware of having done anything out of the ordinary at the gym but the manner and location of the pain made me realise it was certainly muscular rather than a disc. I could treat this myself, I thought and got dosed up with strong pain killers, extra cushions and a hot water bottle and walked around for a bit every half hour. Tuesday came and went with little improvement but lots of frustration when I couldn’t pick things up from the floor. I rummaged in the garage and found a grabber which once belonged to my late aunt which solved the problem somewhat but it didn’t help when emptying the dishwasher and although it was good for putting out the empty milk bottle I had to crawl to the door and bring the full one in in stages. Over the next few days my back improved but although I was virtually pain free by yesterday I was aware of a tightness in the muscle and finally gave in and go and see somebody. A friend recommended the Cheshire Chiropractic Clinic which happens to be in Northwich. I’ve always had some misgivings about complementary medicine having heard many stories about unqualified practitioners but I checked the clinic out and made an appointment. I have to say the assessment was very thorough and I was relieved when he made the same diagnosis of a muscle strain as I had. The treatment wasn’t unpleasant although having wedges propping up each side of my body and the table dropping suddenly as he poked and prodded my back was a bit weird but the massage which followed was very relaxing. Treatment finished and then he said my back would probably be worse later and I should apply ice packs for 10mins each hour. He was right! That’s where I’m at now and I don’t much like the ice pack, much prefer a comfy hot water bottle but I’ll do as he says and go back on Tuesday for a repeat performance. I know many people swear by these complementary medical practitioners but I have always been wary, however, now I can tick another experience off my list and assuming the pain goes away for good it’ll have been worth overcoming my fears. A new experience for me today! I’ve been to a “Ladies” lunch held in a posh hotel in aid of the local Hospice. As my normal attire is jeans, my first dilemma was to find something to wear. All of my skirts or dresses have been thrown out as they no longer fit, (going to the gym has it’s downside) so I bought some smart trousers and thought that would do. However, when I arrived it was clear that to the great and good ladies of the area this was an occasion for fancy dresses, tottering heels, beautifully coiffured hair, full makeup and plenty of bling. I was decidedly under-dressed! Nothing I could do about it but hope that the lunch would be good. Alas, it wasn’t the case! Overcooked salmon with three small new potatoes, and for some bizarre reason peas and mange tout! Peas & Peas? Dessert was supposed to be Eton Mess, but it was mostly cream; few strawberries, meringue that had disappeared and ice cream that had already melted! Added to this the service was appalling, there were too few waiters to serve over a hundred people so one half of the tables had finished their course before the other half had been served which presumably contributed to the melted dessert. The highlight of the occasion was an after lunch talk by Tricia Stewart, one of the original WI calendar girls from 12 years ago. She was a very good speaker with funny anecdotes that women of a certain age could easily relate to and it was interesting to find out that even after so many years later their initiative is still raising money for Leukaemia Research. It is said that we should embrace new experiences! I’m glad that the event raised money for the hospice but now I’ve done the “Ladies who Lunch” thing I’m not looking to repeat this particular experience! I haven’t had any fish & chips since I moved here nearly three years ago but yesterday I suddenly got an overwhelming desire to rectify the situation. After a quick search on tinternet I set off with great anticipation. Saturday night is probably not the best time to buy fish & chips ‘cos when I arrived the place was heaving. The smell was as lovely as ever and the golden battered fish was all piled up in the hot boxes. I got to the front of the queue eventually and asked for Haddock & Chips, only to be told they didn’t have any just the fish in the hot box. “What is it?” I asked and was told it was cod. I asked for that and then noticed that the board with the price list just said ‘FISH’! I have to admit the fish was tasty but no way was it cod; no large white flakes and in fact it was as thin as plaice but not as expensive. So what was it? I believe fish shops have been encouraged to stop selling cod because of the reduced stocks but surely they should be required to name the fish they are selling. Listing unidentified fish on the price list would seem to me to break all the rules of the food trading standards. In honour of the brave suffragettes who achieved emancipation for women, I’ve cast my vote in every general and local election since I was 21. This time I was so fed up with the major parties sniping at each other I was seriously considering giving it a miss. I’ve had loads of bumf from the various party central offices but until yesterday I didn’t know who the local candidates were. 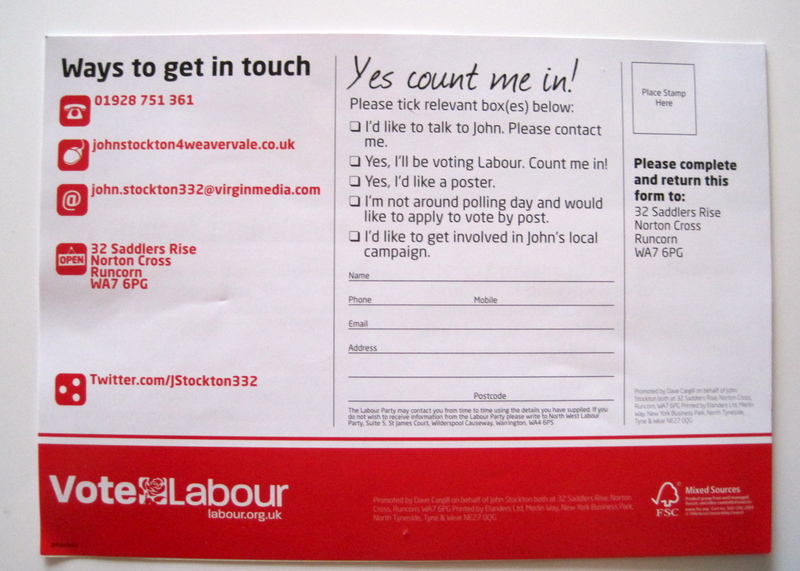 I’d read that John Prescott’s son had stood as a prospective candidate but then heard he hadn’t won so I was pleased, yesterday, to get a leaflet from the winner, John Stockton, Labour candidate for Weaver Vale. He listed a telephone number, a web site, e-mail address and amazingly he was on Twitter. Great, I thought, someone who’s up with technology, I’ll be able to find out who he is and his ideas and plans for the local area. First I tried the website but Google couldn’t find it, then I put him on my Twitter list and sent him a message to this effect. On a personal level, I found out he has been a local councillor, runs for charity and that’s about it! The rest of the information on the site was rehashed Labour policies and soundbites; nothing about who he really is what he wants to do locally for the constituency. This morning I checked his Twitter feed and found he has tweeted three times (the first was March 28th) on the lines of ‘amazingly busy/long hard day visited etc etc met lots of nice people etc etc’ What does this tell me about what he really thinks? Can I trust him to be honest and principled? Or, as it seems to me, he’ll be toeing the party line. Candidates have access to the internet and social networking sites which gives them the opportunity to reach people on a personal level and put over their thoughts and ideas. Writing a bland website, (or rather having one written) and signing up to Twitter without any idea of how it should be used is just paying lip service to technology and personally doesn’t encourage me to vote for them. That having been said, I’ve received nothing from the local Tory or Lib Dem candidates so my decision to vote or not is still up in the air! I’ve had been aware for some time that I was finding it increasingly difficult to read the small font on food labels so five weeks ago I finally went to the opticians. Having my eyes tested is second only to the dentist on my list of most hated activities, so I didn’t go for the appointment with any joy. I hate them blowing air into my eyes while telling me not to blink, then the flashing lights of the peripheral vision test is enough to put me into a panic; I’m always sure I’ve missed some! Then it’s the red and green lights and the optician asking ‘better or worse’ as she flips the lenses in front of your eyes and while I’m trying to decide she flips them back again. Next I have to decide on which frames I’m going to wear for the next two years and not end up hating after two months; then I hold my breath as the optometrist adds up the final cost of lenses and frames. Finally the torture is over and I can escape. Two weeks later I went back to pick up the new glasses. As I was driving home I was aware that they didn’t seem right and reverted to my old ones. I put the new ones on when I got home and as I knew that I’d had a big change in the prescription for both distance and near vision I persevered wearing them throughout the day. The next morning, I put the new glasses on again and suddenly became aware of a black line moving across the vision in my right eye as I moved from near to distance vision; on went the old glasses but it was still there. Sometimes it was a sharp line, sometimes a grey blur. It stayed all day and was there again the next morning. Very scary! After the weekend I went back to the shop and after making a fuss with the ‘jobsworth’ receptionist I was finally told I could be seen by the optician. The optician was very thorough and understanding of my fears; apparently I’m not going blind but have PVD, (Posterior Vitreous Detachment) the colloquial name of which is ‘ floater’. She said I have a large floater and it was a coincidence that it appeared at the same time as I got my new glasses. I understand that about 75% of people over 65 have PVD and can take up to 6 months to settle down if ever! So here I am with black lines moving across my eye willy-nilly as a constant reminder of the passing of the years. I’ve just heard that today, 4th February 2010, is a momentous day! My 7yr 9mth old grand-daughter has walked to school on her own for the very first time. I have to admit that when my daughter told me, I got a sinking feeling in my stomach. I can’t explain it, instead of applauding Mods newly found independence, my mind raced through all the things that could go wrong. What if she got distracted and ran into the road? What if she was led astray by some undesirable person? Too ridiculous! it’s not far to school, many parents walk the same way and there’s only one road to cross which has a light controlled crossing. She asked to go on her own and a couple of children in her class who live on the same street have been walking on their own for some time. I know my daughter had some misgivings but Mods is a very sensible little girl and was so pleased to be allowed to do it, she went skipping down the street with a big grin on her face. As parents our job is to bring up children to develop their independence as they grow into adulthood but as each stage is reached it means you are no longer in control; you have to come to terms with not being able to protect them all the time and they will begin to have a life that you know nothing about. So on reflection, I think my initial reaction was really sadness that she is growing up and is no longer a baby. I didn’t experience this with my, now 17yr old, grandson since his primary school wasn’t within walking distance but last week had to come to terms with his rapidly approaching adulthood when he passed his driving test. So parent or grandparent it makes no difference, the feeling of having to let go is the same.